Direct Assessment and Response Consultation: WTS consultants will meet face-to-face with employees-of-concern to conduct professional risk assessments at designated employer locations. These are usually conducted at the employer’s site, with appropriate security measures in place when prudent, or at other designated locations such as hotel conference rooms. WTS consultants first work with the employer’s team to gather necessary collateral information, from managers, witnesses, security, team, or HR interviews, document reviews, and other background information gathered under the direction of the team and its legal resources. WTS provides debriefings on its findings and further recommendations immediately following the assessment interview, and continuing as appropriate to each case. Written reports may be provided. 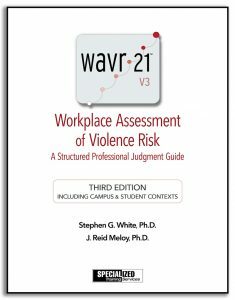 Indirect Assessment and Response Consultation: WTS consultants will provide opinions of violence risk and recommend actions based on the information available prior to a direct face-to-face assessment, or when one cannot be conducted. These opinions are updated as information develops in the dynamic threat assessment/management context. Indirect assessments may be provided for any subject of concern, and especially in cases of outsiders such as former employees, domestic/intimate partners of employees, customers, patients, or stalkers. Incident Management Consultation: Working collaboratively with an organization’s team, WTS consultants will contribute to intervention decision making. Experience has proven that flexibility and tailoring responses to each case leads to successful outcomes. WTS is keen on “resolution and recovery” – the matter is resolved in that involved-others are safe and feel safe, that those with residual fear or other needs are debriefed and directed to appropriate personal resources. It is desirable that the team and managers have a better understanding of “what happened and why” within the limits of appropriate disclosures. We are aware of employment law and other legal guidelines and routinely work with the employer’s legal counsel. Fitness for duty exams may be conducted when an employee exhibits behavior that does not generate a reasonable concern for safety but that 1.) impedes job functioning and 2.) raises a concern that a possible mental disorder is the cause, or the employee self-discloses a mental disorder as a presumed cause. Fitness for duty exams are conducted by licensed mental health professionals specifically qualified to evaluate the impact of clinical conditions on job-related functioning, and whether the employee is fit to perform the essential functions of his or her job, with or without an accommodation. Although WTS does not offer fitness for duty exams, some of its associates do provide these services independently.